In the Rose Garden / New Manga Chapter!! Wonder if these â€¦ umm, designs are gonna be â€œcanonâ€ aka showing up in the new manga? This publication is a memorial of the 35th anniversary of Saito's artworks, in which the dialogue between Saito and Ikuni is also posted. Does that mean Ikuni is officially involved with this new manga?!?! Damn. Oh well, a guy can hope. While listening to the music of Utena and doing the name of Utena color of the September issue and the inside of the head is going to be Utena, I tried to make the icons and the background Utena ... __ ___ ___ ___ 0 I uploaded it already! (^ O ^)! OMG! She replied to me! I think this has something to do the new manga... Definitely has something to do with it. Looking at this image, I'm reminded of the Akio Arc duels - specifically, Touga's [final] duel. I wonder if this indicates [in any manner] the contents of the new manga chapter? Either way, its nice to see some more official [manga] art floating around! Should I be looking into how to get my hands on this to scan it for everyone? 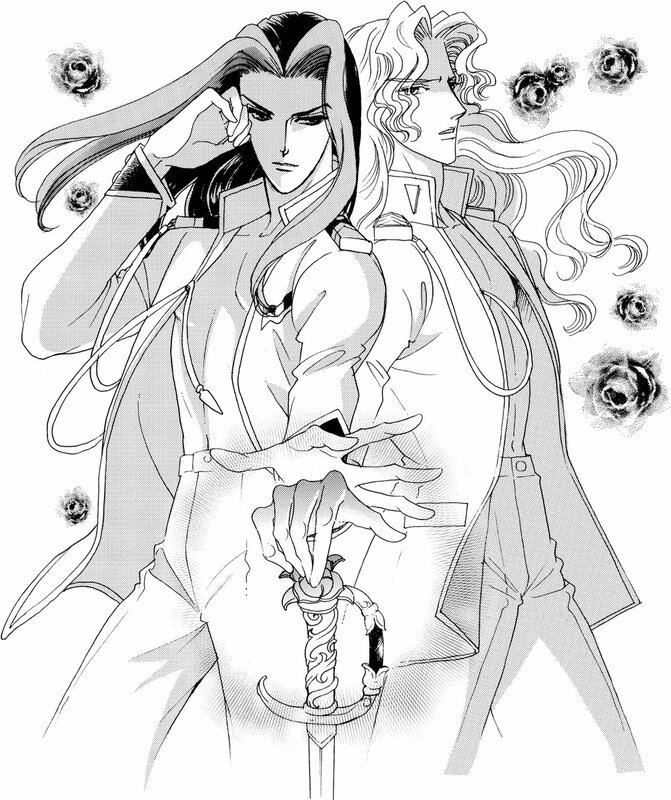 Or just for me because Touga and Saionji? You should be able to acquire a copy of the September Flowers issue through CDJapan - I just bought one, myself. However, I suggest that, if you want one, you get it ASAP - their stock is nearly depleted! Right on it! Except I ordered from Amazon Japan, since they also had all three of these newer Seazer CDs. This will be a priority one upload for me, and if someone translates I'll happily do the image editing from there. Ya'll won't be going without for long. (sighs) My crush on Saionji has been rekindled. Anyway, I hope It's some sort of deleted scene rather than a story with new characters. Both would be good though. I hope so, too. That seems likely if by the art she's posted we're supposed to infer that Utena is in it, and Touga and Saionji are still duelists. I suspect my dreams of a graphic orgiastic pile on will probably be shot down, though. I have already preordered that particular issue of Flowers, and I believe that Gio has done the same. So, whoever gets their copy first will provide the scans, I guess. As for translating the manga, I'm sure someone on here will be willing to carry out that task... for the right price. As per usual I will be scanning for retarded quality and will butcher my copy of the book to facilitate this, so if you want to leave yours nice and intact go for it. I'd be surprised if no one would translate it across the sku fandom once I have it up and all so I'm not worried about getting to read it. If for some stupid reason that falls out, I have a friend that does scanlation work sometimes so I might be able to get a translation hookup for this short an item. I am assuming this is a standalone and not taking up subsequent issues? If that's not the case I'll be doing my best to get them copied and scanned, though my funds might get tight here. "I'm drawing a new episode "Utena" right now. I might draw a little episode a little more"
I'm assuming that the new chapter is the one that will be appearing in Flowers this month, but who knows. So... no confirmation about more Utena chapters, but we can certainly be hopeful! I'm sure we'll know based on the magazine but hopefully we have an idea sooner than that so I can order the next one without concern for running out. It's a sixty-page one-shot as part of a special Saito anniversary celebration. No more has been announced. Whatever Saito's feelings about wanting to do more, or possible insider knowledge, if there's more Utena coming they'll announce it in advance, just like they did this time. You should be safe with the one issue. Hahaha piece of cake, I can scan and process 60 manga pages in a few hours. ALl of us please! OMG I am so excited I could burst! I can't wait for this to come out! I'm not the best ever, but I can translate. My two years of Japanese in college and kanji identification software get the job done for the most part. If it's not Touga and Saionji getting married and living in domestic bliss with their adopted daughter Nanami then I am simply not interested. EDIT: HOLY CRAP I didn't realize this thread had a second page and I just saw the Touga x Saionji image and WELL DAMMIT COLOR ME INTERESTED. So, is the magazine itself out now? I just saw this too on Twitter! New episode "Girl Revolutionary Utena After The Revolution" of "Girl Revolutionary Utena", which Beipa Past acts as the original and Saito Chi handles the manga version, appeared in the monthly flowers 9th month (Shogakkan) released on July 28th today. The initial setting of "Girl Revolutionary Utena" rough. In the episode newly drawn this year, which celebrates the 20th anniversary of the broadcast of TV animation, the story is developed on stage at the Feng Gakuen which passed from the last round. What is the figure of a certain person who visited Phenomena Gakuen. Also in this issue is a dialogue with Saito Kunihiko who served as director in TV animation, Saito. From the encounter of two people, "Secret story of production of" Girl Revolutionary Utena ", talked about his thoughts on new works for the first time in 20 years. In addition, we posted the initial set of Utena and Ansie 's default rough, which we also worked on the original character design. Also this winter, I decided that the second volume of "Girl Revolutionary Utena" new work will be posted. Details will be announced on the magazine of flowers. In this issue, Saito appeared in two stories with serial series "Transfer Â· Bay". In addition, to celebrate the 35th anniversary of Saito's arts, from August 13th to 20th, an original picture exhibition is held at Tokyo Â· Sanseido bookshop Ikebukuro main store. In addition, as the 12th volume of "Transfer and Bay" is released on August 10, signing will be held at the same venue on August 19th. Let's check details on how to participate in the magazine. - TL provided by webpage. Too many errors to fix atm but you get the jist.